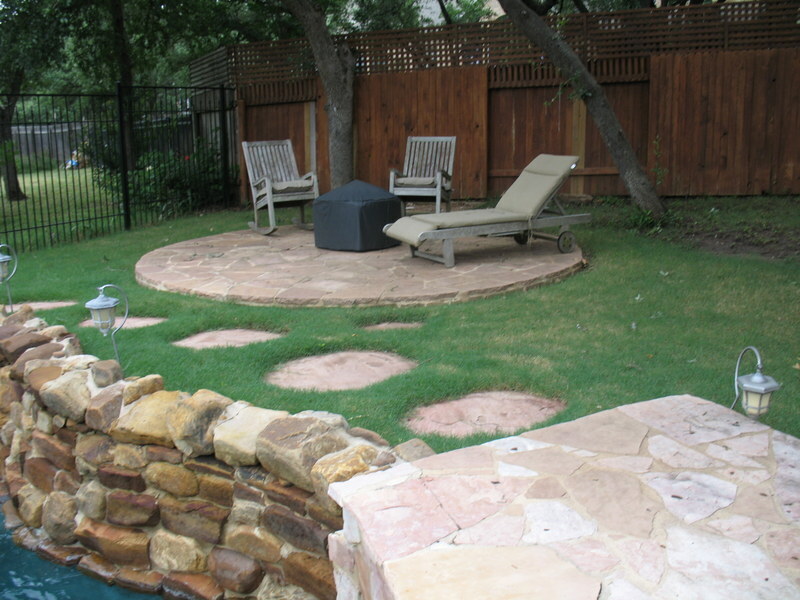 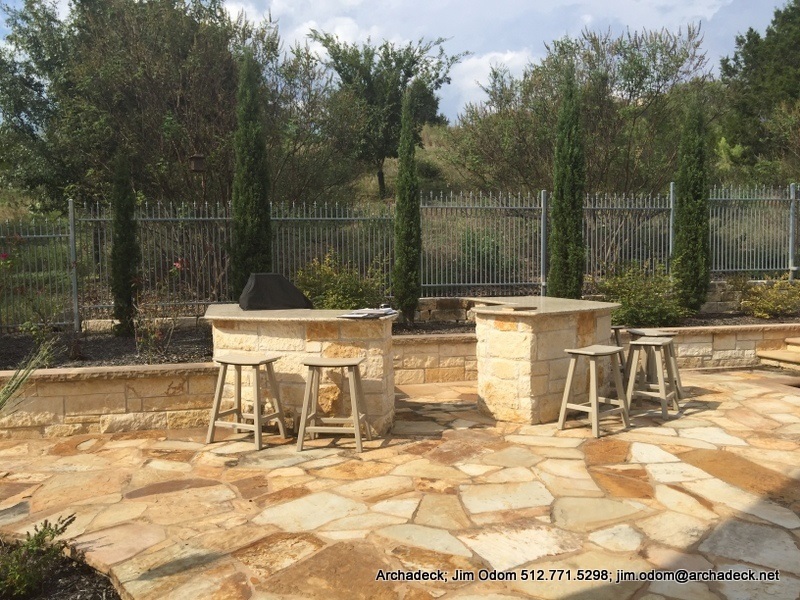 Outdoor kitchens are among one of the most popular of all the amenities in outdoor living design. 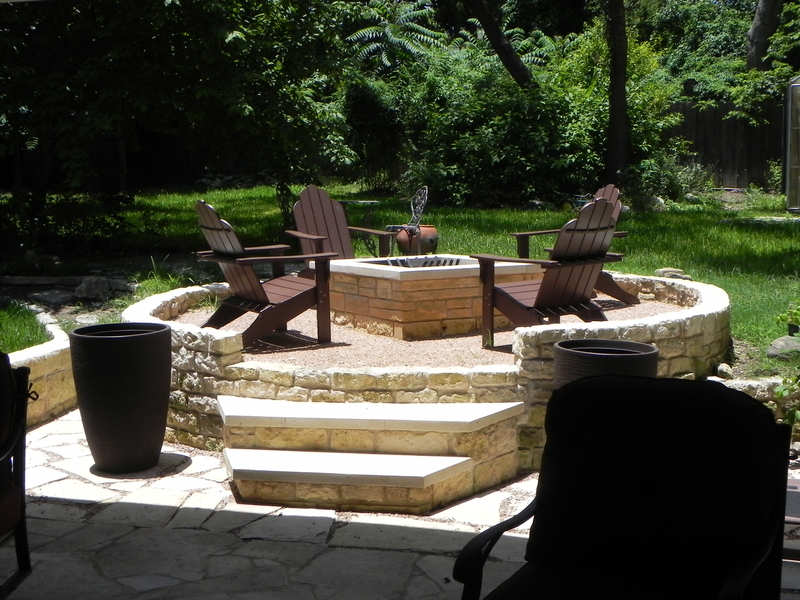 They provide an area to prepare food outdoors and save an abundant amount of time that would normally be spent running back and forth to the kitchen within the home. 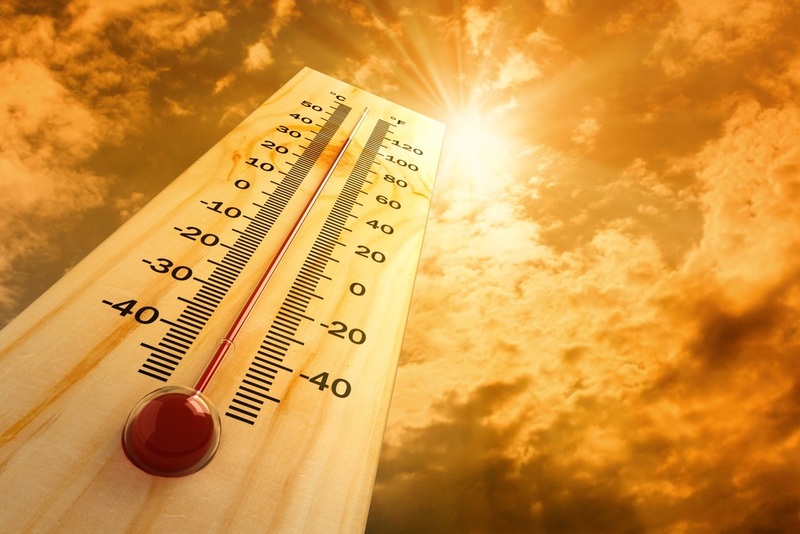 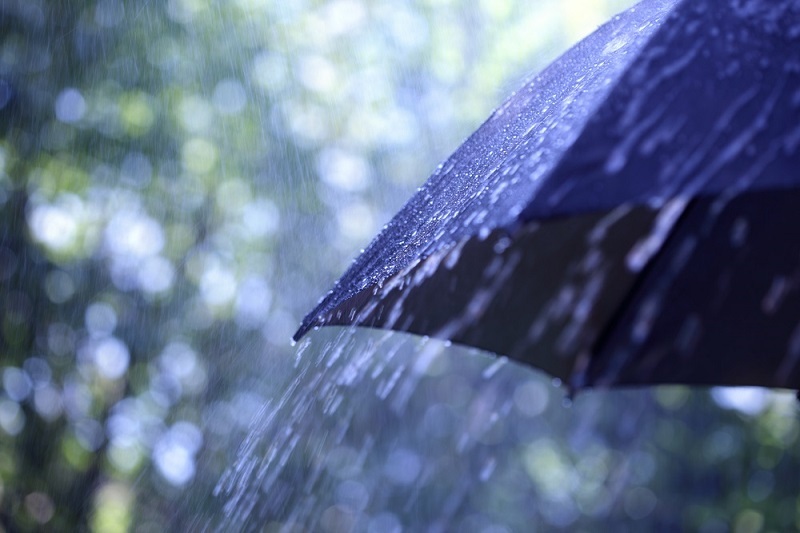 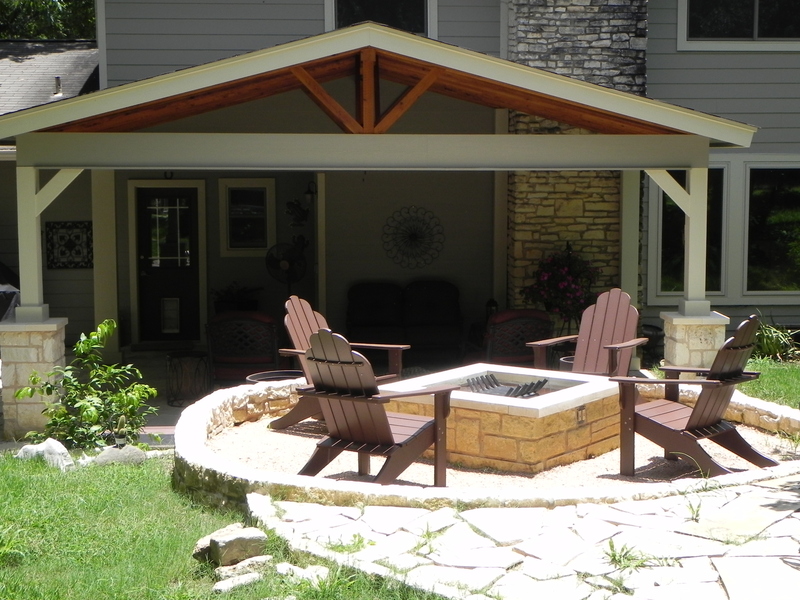 Based on the accoutrements they contain, these outdoor marvels can aid you in storing, preparing and even keeping food warm and beverages cold. 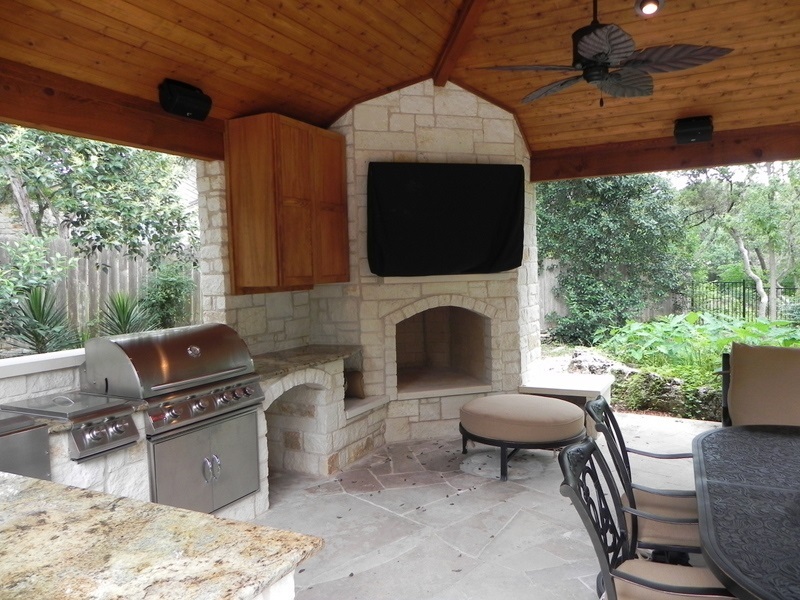 In the case of our most recent completed project located in Austin’s Riverplace community which sits on the back of the Riverplace gold course overlooking the greens, the homeowner’s had a lovely existing kitchen atop a stunning patio, the only facet this space lacked was protection from the elements and shade. 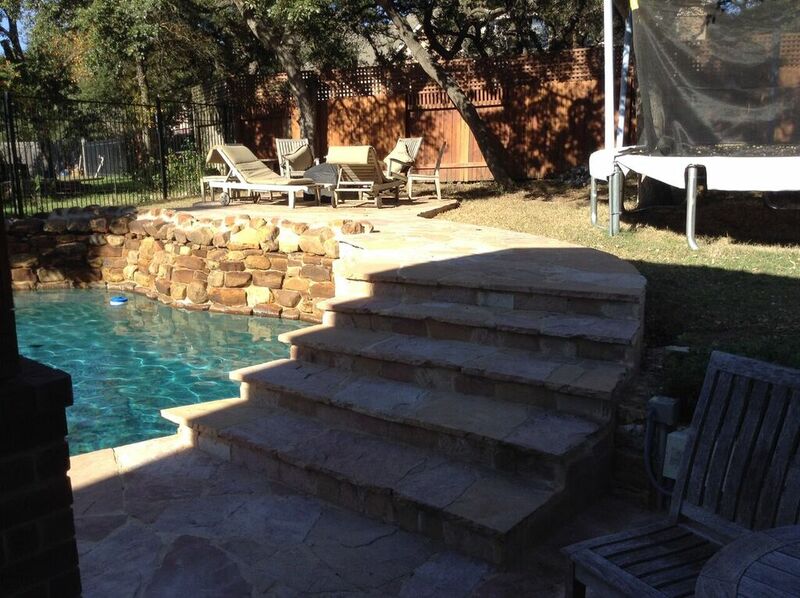 That’s where Archadeck of Austin enters the picture. 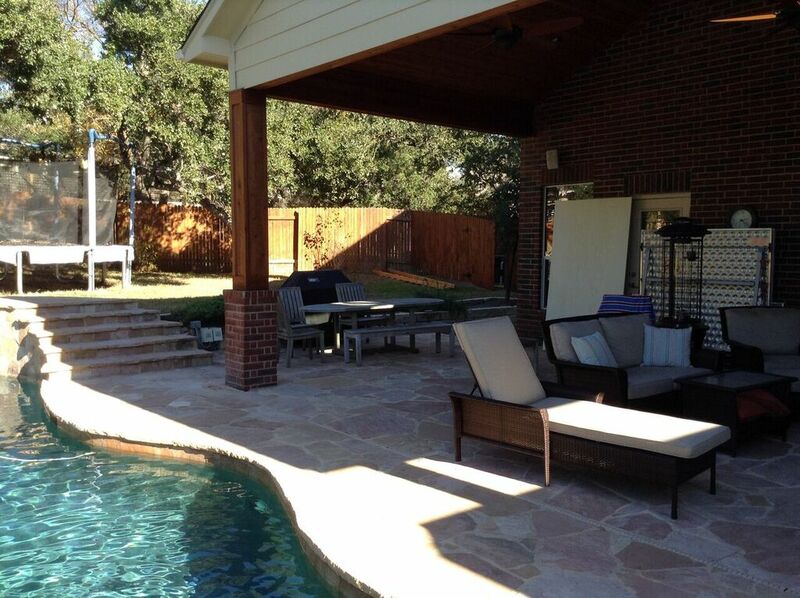 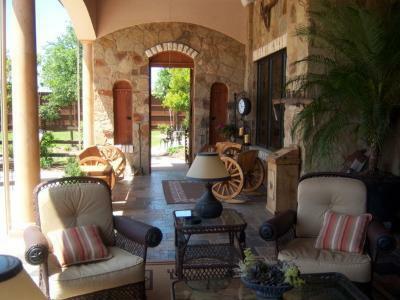 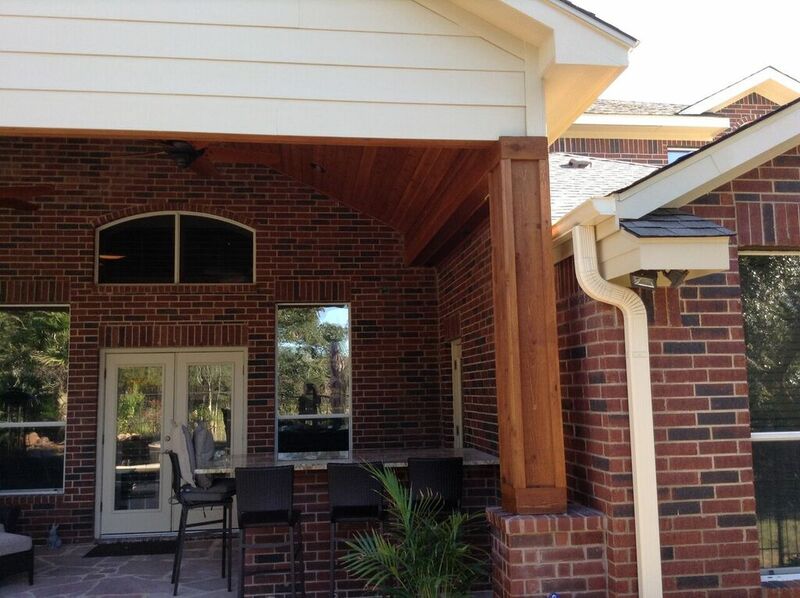 These homeowner’s contact us to design and build a porch cover specifically for their existing outdoor kitchen. 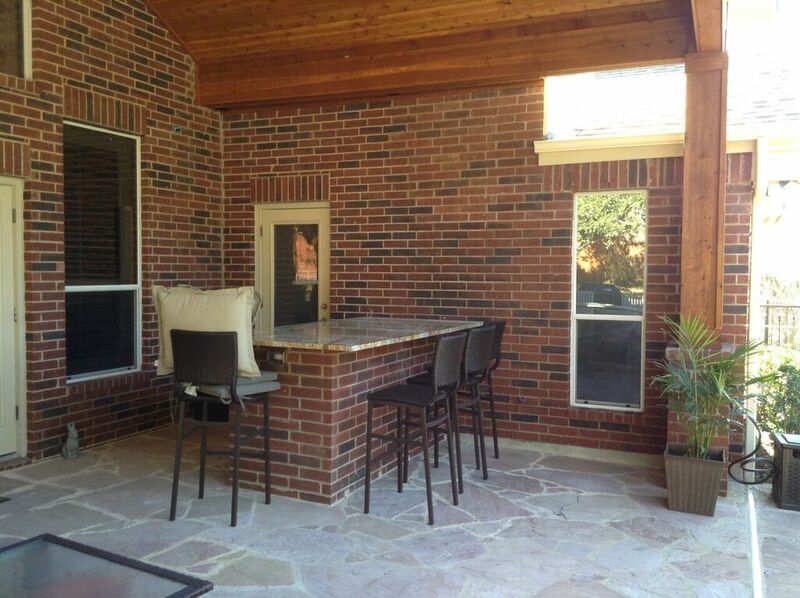 Outdoor kitchen and patio before we built the porch cover. 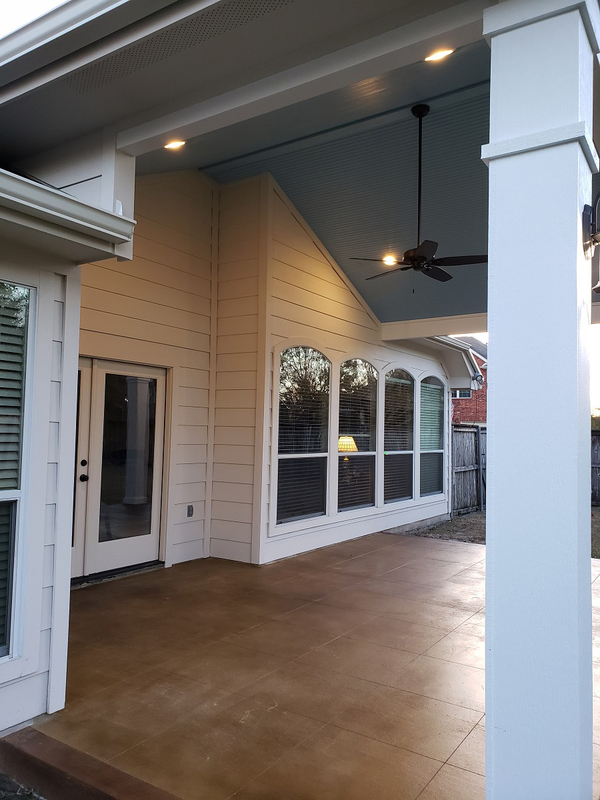 The covered porch we designed and built is an asset to the landscape and provides the versatility these customers were craving. 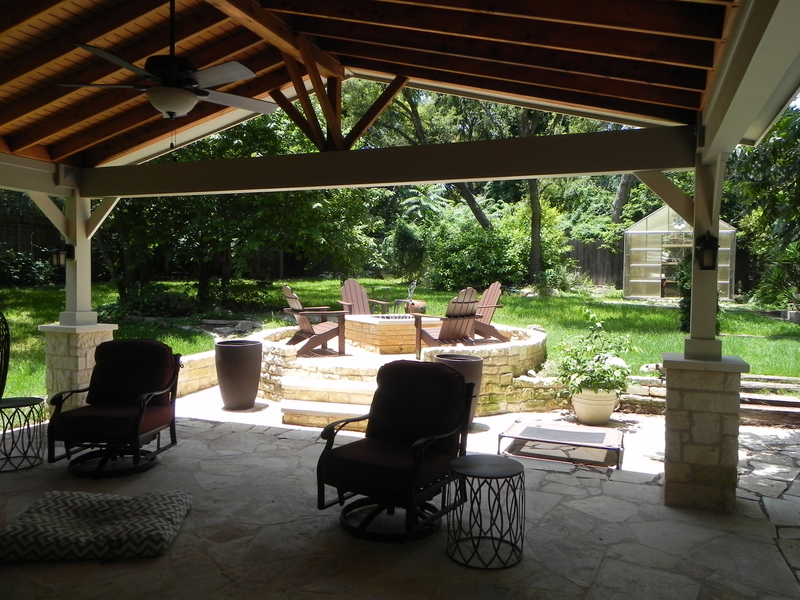 With a post & beam gabled roof design and concrete tile roofing, the new space begs for attention. 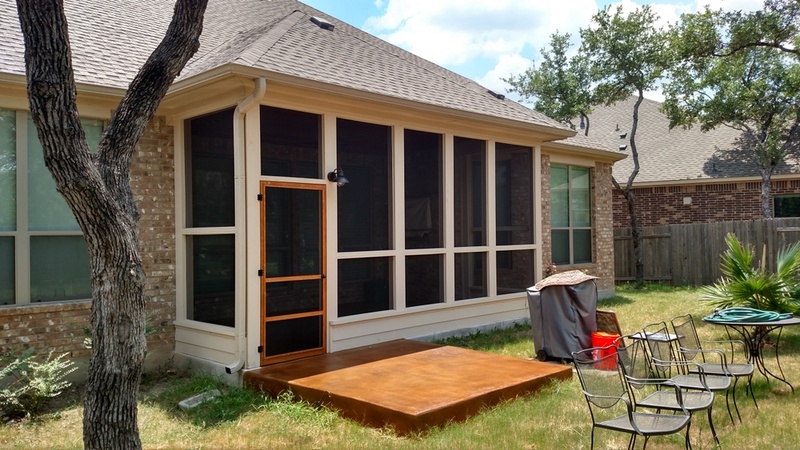 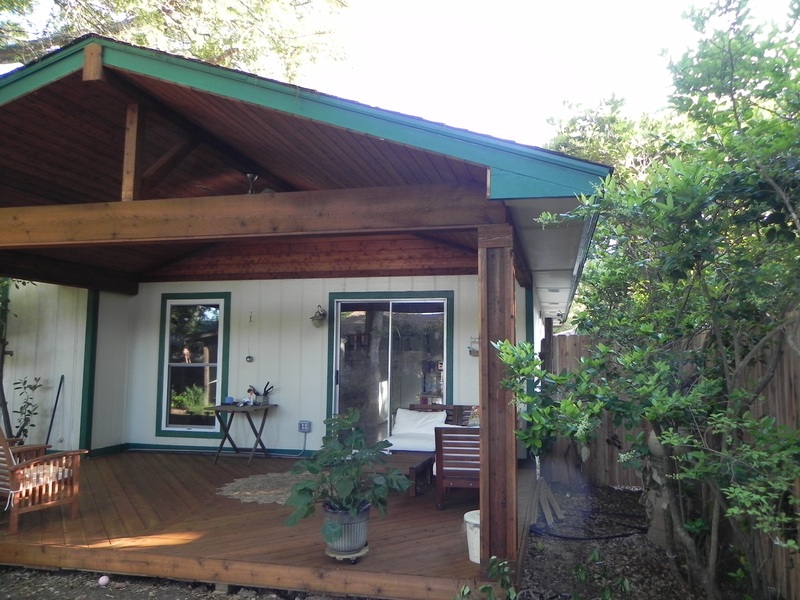 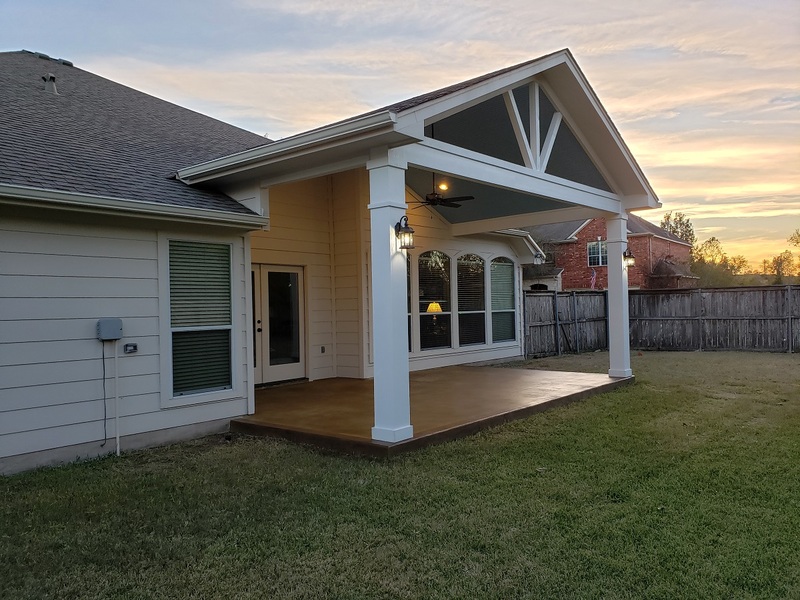 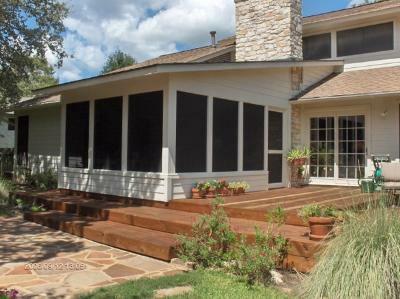 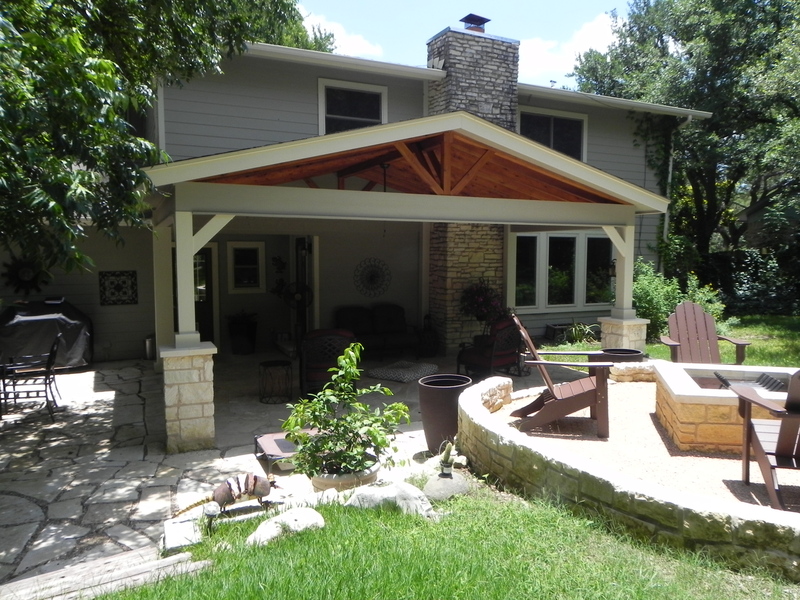 Archadeck of Austin “beefed” up the appeal of the porch cover with an extra-large overhang which keeps the saddle-style barstools the homeowner’s placed around the car area out of the elements in case a rain shower pops up. 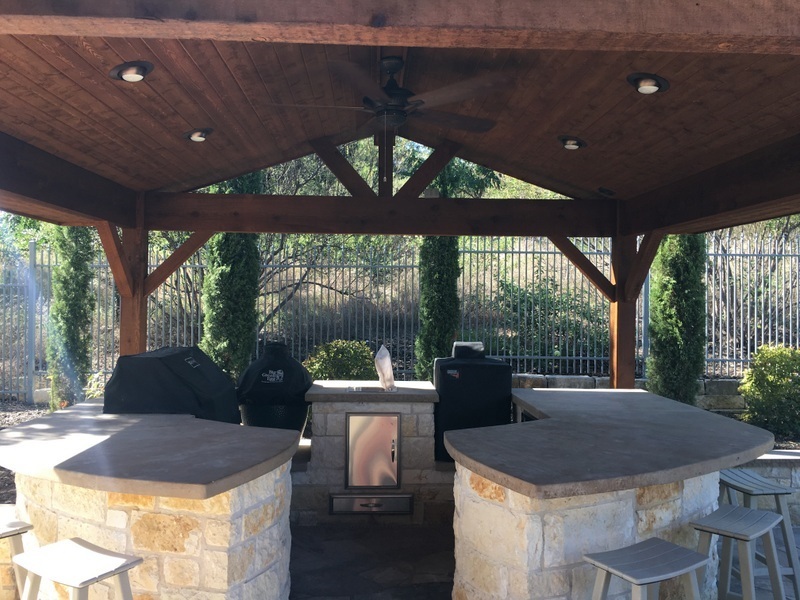 No stone was left unturned regarding inclusion of all the luxurious extras that make the space inviting and cozy day or night. 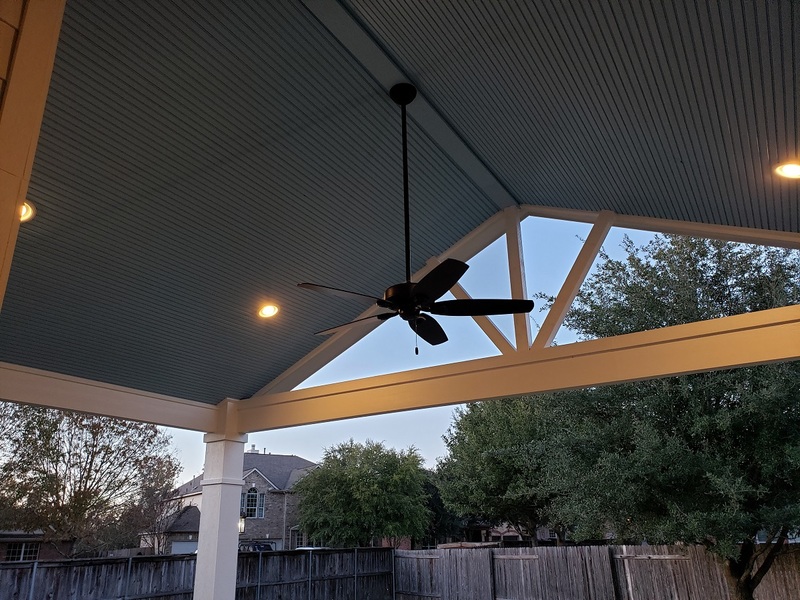 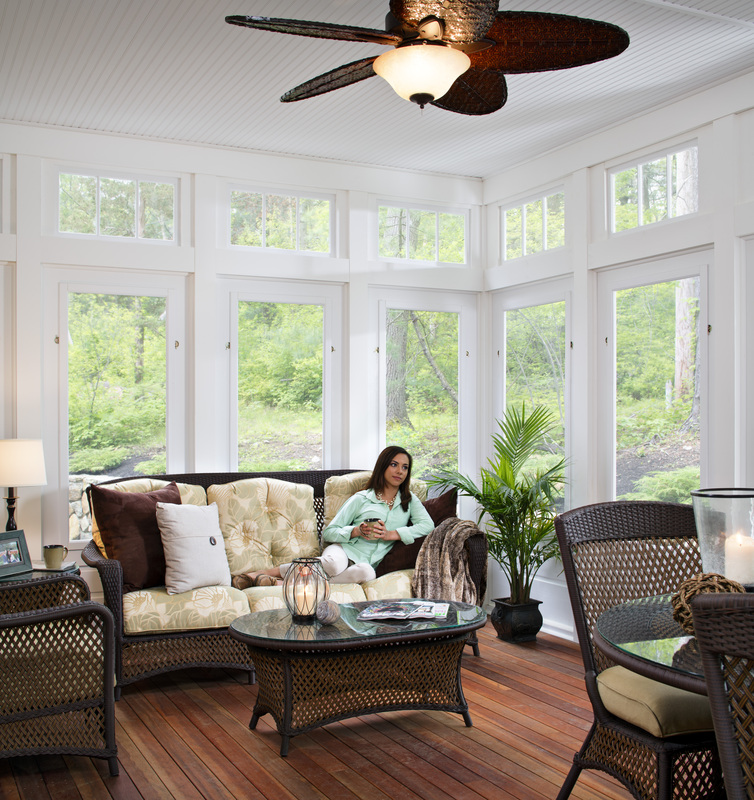 Sconce lighting, can-style lighting and a ceiling fan allow for comfort even on those hot Texas afternoons or in the evening. 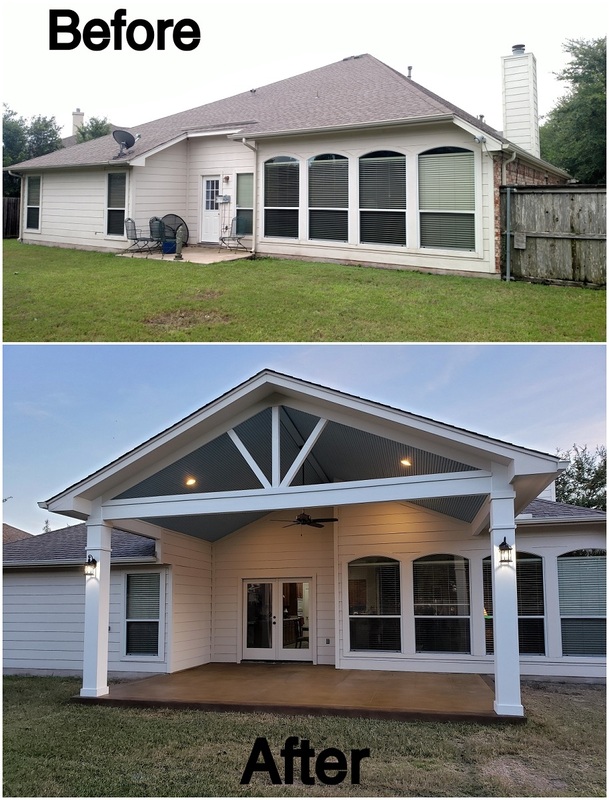 The entire structure was meticulously matched to ensure it mimics the dolor tones and style of the existing home on the property. 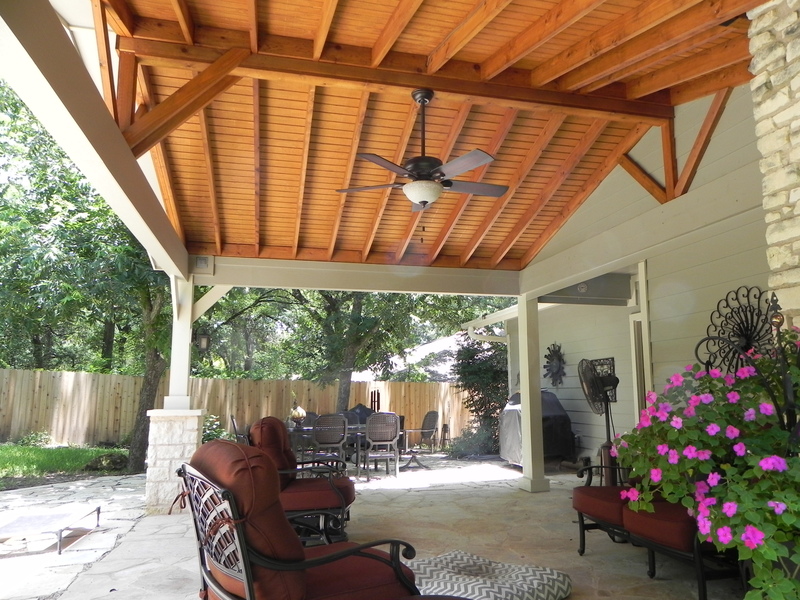 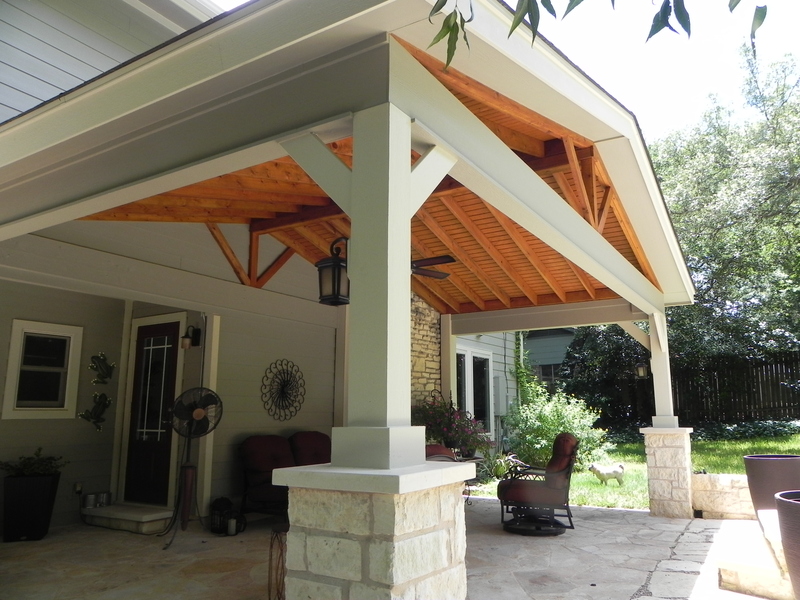 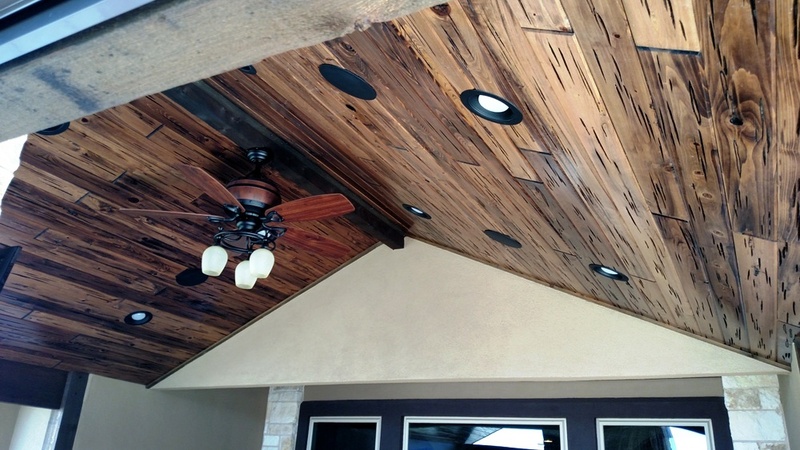 We installed a beautiful cedar ceiling to match the interior of the homeowner’s existing covered patio too. 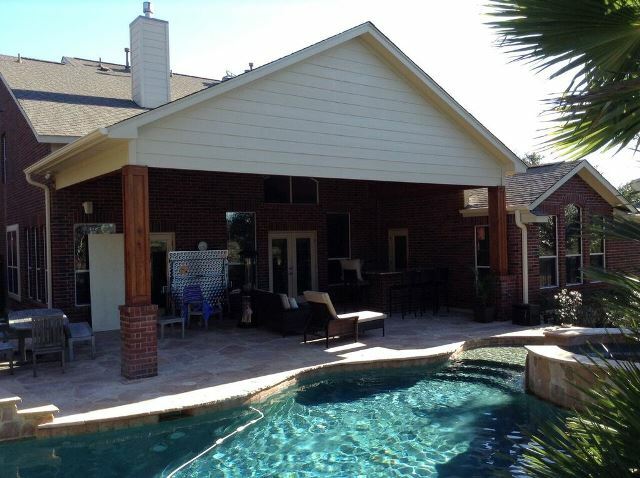 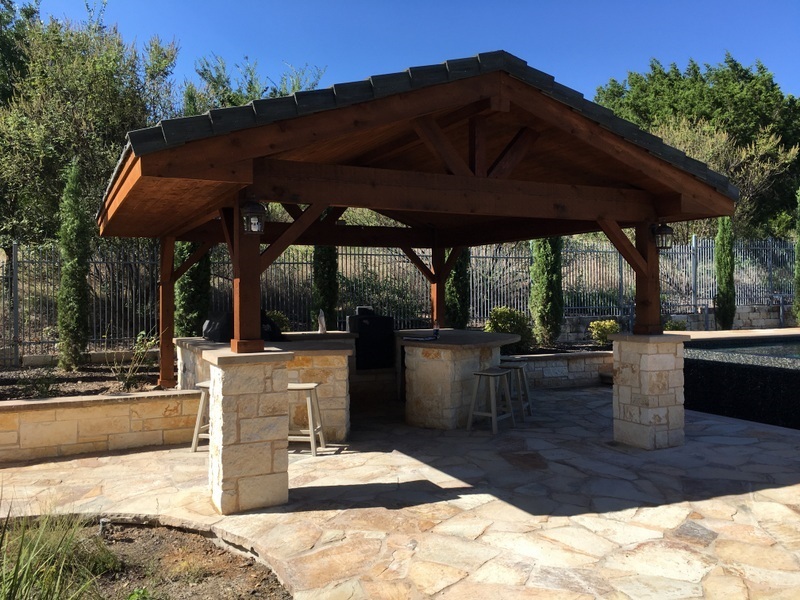 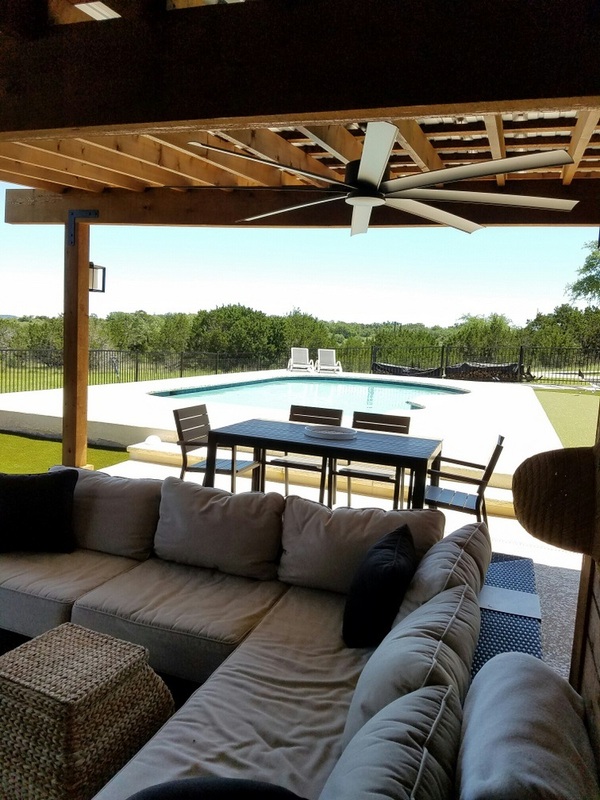 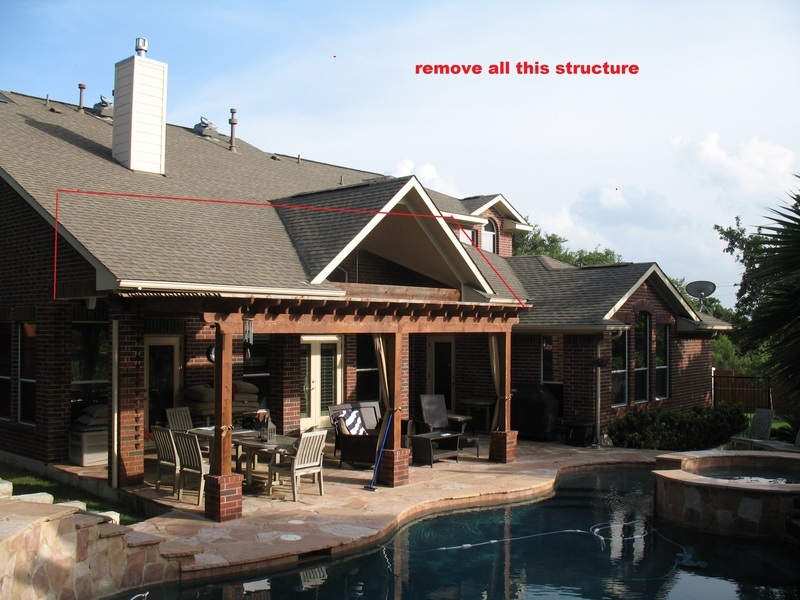 The finished structure completes the perfect recipe for these homeowner’s to make the most out of their outdoor living enjoyment. 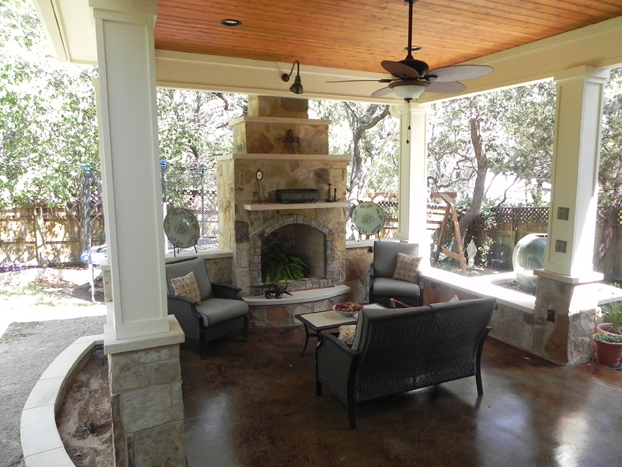 It adds flavor and versatility to the way they now live outdoors, with a pinch of elegance and a dab of luxury, this outdoor room satisfies! 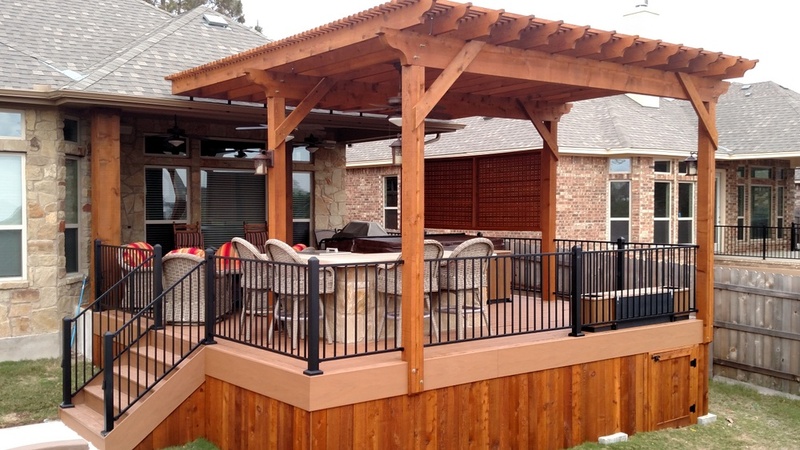 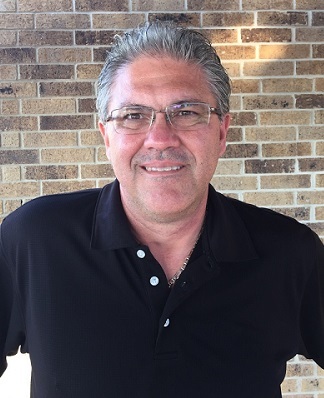 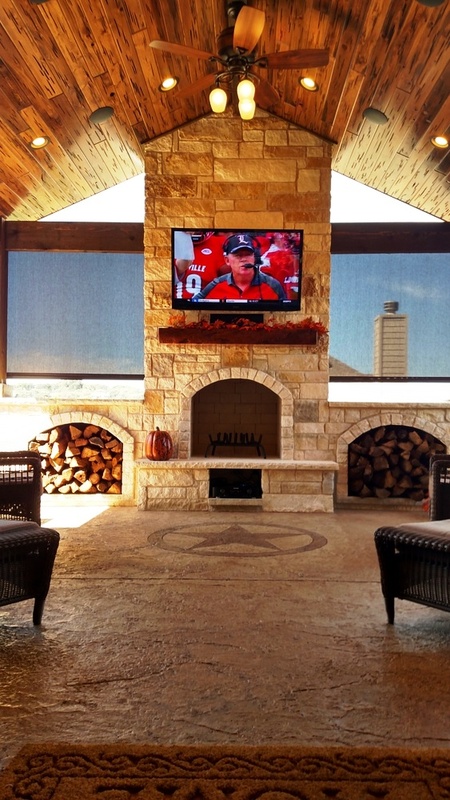 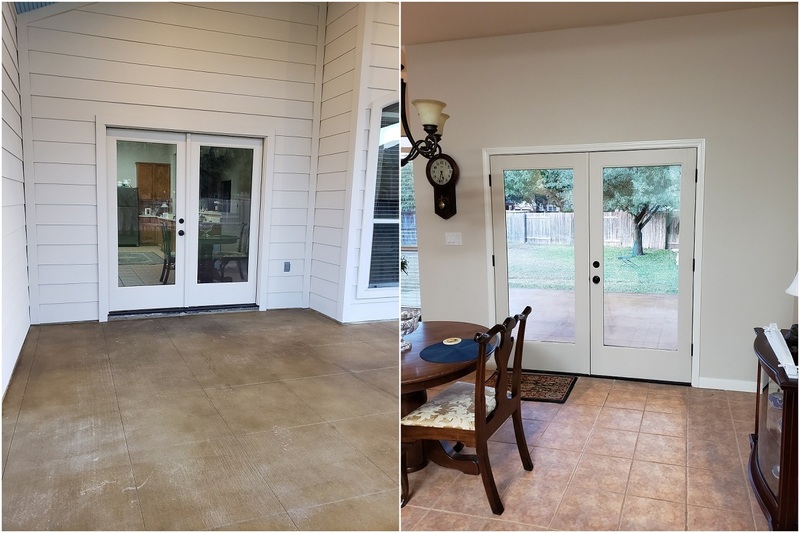 If you are ready to transform your existing outdoor space, or design and build a new one from scratch, contact Archadeck of Austin today at (515) 259-8282 or via email at jim.odom@archadeck.net to schedule a free design consultation.